Mix remaining ingredients except egg whites and bread together well in shallow dish or zip top bag. Add chicken to marinade and place in freezer for 30 minutes. Using food (meat) grinder and fine disk grind the chicken and spices into mixing bowl. Try to get all the chunks of garlic, cilantro, and ginger into the grinder. Grind the slice of bread last. Using the flat beater or by hand mix in the egg whites. Stir about 3 minutes on "stir" or low or until the egg white is evenly distributed. 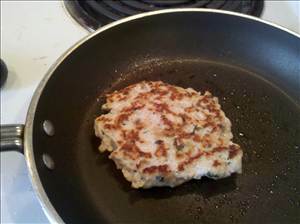 Form into 3 oz patties for grilling or pan frying in a bit of oil or drop it by half-teaspoonfuls into hot broth (boiling or simmering) for Asian style meatballs. this recipe has 1 thick slice of bread in it,how can it only have 2.68 carbs? for LCHF: Low carb, High fat / Ketogenic Diet, Get your Blood-Sugar Act Together!!! There are 125 calories in 1 serving of Chicken Sausage Thai Style. Calorie break-down: 25% fat, 9% carbs, 67% protein.